What's NEW and What's Baking Today? 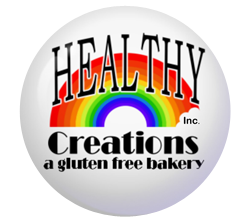 Healthy Creations Inc. began as a made-to-order bakery in 1998, but was moved to a commercial building in Windsor, Ontario, and officially opened in 2009. Now there are three locations: the original store in South Windsor (SW corner of Dougall and Cabana), the second store 502 Springbank Drive, Unit 2 in London, Ontario, and the third store at 33 Amy Croft Dr. in Lakeshore, Ontario. We guarantee you will find something to love at Healthy Creations. Chris Brecka opened Healthy Creations Inc. to the public in 2009, but she started gluten-free baking in 1994, when her three-year-old son was diagnosed with Celiac disease. The gluten-free diet positively saved his life. In 1996, her youngest daughter was also diagnosed with the disorder at the age of three. Chris became determined to create products that would rival their gluten counterparts, helping those who have food allergies feel more included. We do not use any preservatives to retain freshness in our bread products. It is advised to keep on the counter what you will consume in 2 days and freeze the remainder. We do not recommend refrigerating to keep fresh as the refrigerator will dry out the bread. When you remove your product from the freezer wrap in a damp paper towel and heat in a microwave for 30-40 seconds to bring it back to it's original softness. 1. Join one side wall to one peaked wall. Pipe icing along the bottom and inside of the side wall and along the bottom of the peaked wall. Join the panels so that the side wall is positioned on the outside edge of the peaked wall. Press the sides together and attach to the base. Hold in place for several minutes until the icing begins to set. 2. Attach the other side wall and peaked wall in the same way. 3. Press together, and let dry at least one hour before going to the next step. 4. Pipe the icing along the roof angle of both peaked wall panels and along the top side walls. Pipe icing along one long side of one roof panel. (This will be the peak of the roof.) Position one roof section, so it meets the peaked wall and side wall edges. 5. Hold this half in place while you add the other roof section. 6. Adjust so that each side is evenly pitched and the center seam meets. Press and hold in place several minutes to allow the icing to set. 7. Let your house dry at least two to three hours before decorating. Celiac disease is an intestinal disorder that is distinguished by an allergic reaction to the ingestion of gluten. Gluten is a protein that is found in wheat, oats, barley, rye, and any derivative of those grains. Common food products like bread, pasta, bagels, crackers, cakes and cookies, all contain gluten. Through the process of digestion, our food makes its way to the intestine, where it is further digested and then absorbed into the body. The intestine is lined with tiny, finger-like appendages called villi. The villi are the points where our food is directly absorbed into our body. They remove the valuable parts of our food, like vitamins, minerals, protein, fat, and sugar, and pass it into our blood stream. If a person with Celiac disease eats anything with gluten, it will destroy the villi in the intestine, and the body will not be able to adequately absorb essential nutrients. The intestine will eventually cease to function properly, and undiagnosed Celiac disease could lead to further complications. This disease is also difficult to diagnose, because it mimics symptoms of several other common illnesses.